First I stood up, and Tony paused briefly in his eating, but when I stood still he went back to his bun, and then I took one step back, away from him, and he didn’t notice, and another step, and then another, and another and Tony kept eating his bun. Then turned around, closed my eyes and ran. It was a lost classic for Michael Ondaatje as no other book has brought him close to his lost self. When Dr Tissa Abeysekara won the Gratiaen Prize in 1997, he really deserved the prestigious Sri Lankan award for the best new work in English. “I have a feeling that the title might confuse the reader,” Abeysekara opens up with hands comfortably resting on his desk - his words flow down with a smooth poetic edge - “they will think it is the same work, which is not. 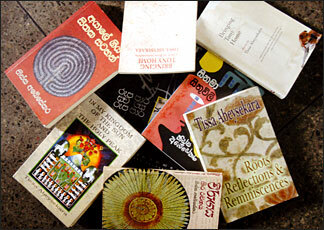 Bringing Tony Home marks the Abeysekara symbol in Sri Lankan fiction in English. His creative concentration flows slow but steadily enough. His sentences are sometimes long and short at times, banking wholly on his nuances. Abeysekara no doubt comes down from a very bilingual family settled a little away from the city. When sensibility seeps through, Tissa has a handle on both languages he grew up with. Language should be reworked, his reflections call out. “When I write, I do it the way I want. My sound patterns and rhythmic structures are quite different. They don’t follow the way of Oxford English. Write within the language. So to say the language command itself does not produce a gifted writer. Tissa Abeysekara must speak of the creative capacity, then. Sarachchandra translated his own Malagiya Ettho into English as ‘Foam upon Stream’. 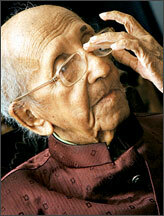 Sarachchandra is well-known for his versatile creativity, and Tissa observes it in a different wavelength. It is a universal phenomenon among the non-native writers. Rabindranath Tagore’s creativity was dazzling, but he was a little bit out of the language in English. It was the same with Mulk Raj Ananda who wrote in English. But we had good English writers mainly in critical writing. 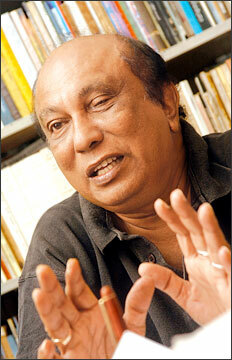 Regi Siriwardena, for Abeysekara, is the finest Sri Lankan critic we ever had. 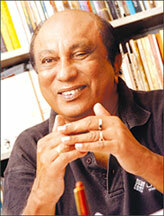 1964 was a decisive year for Tissa Abeysekara, as he joined Lester James Peries as a dialogue writer for Gamperaliya collaborating Regi Siriwardena. Cinematically speaking Abeysekara is well reminisced for his masterly performance of the historic figure, Ven Kudapola, in Puran Appu. His performance lasted only a few minutes but the scene of him falling down for the white man’s gunshot will keep on striking the spectator’s chord for generations. The man of such virtuoso recalls the beginnings. “In fact I did all the stuff - not only writing dialogues but I did the tea man’s job too. But even today I am not sure at which point did I choose filming as my career. Like any other kid, I used to watch films since about seven years of old. You see filmgoing is fun. We get along with others and go to a dark auditorium. And there when the film starts screening, you are no longer under the normal circumstances. That’s why I think, filmgoing is traditionally considered something illicit.” He says with a grin. Sometime in late teens, Abeysekara started seeing films seriously. He frequented British Council and used to read ‘Sight and Sound’ magazine and read quite a lot about filmmakers of the calibre of Ingmar Bergman. And slowly it faded away with the introduction of quota system by National Film Corporation, which was taken as a move to protect the local films. The Golden Period of the local cinema is nothing but ‘within quotes’ for Abeysekara. What does this man of late sixties think of modern filmmakers? Which makes him see them with a lighter heart. “I see three main talented directors: Vimukthi Jayasundara, Ashoka Handagama and Prasanna Vithanage. Vimukthi and Ashoka are not mainstream populist directors. They are mainly experimental directors. We have directors of this category all over the world. They are always trying to push the boundaries. For me Ashoka is a free verse poet in handling the camera. He is very unorthodox, whereas, to be honest, I am a very orthodox filmmaker. Prasanna is a very good home-grown product. He is a superb craftsman, and in fact he knows the language of cinema very well. Anyway it’s a little too early to pass judgment on these young filmmakers.” However much he is acclaimed for his contribution towards filming, Abeysekara’s interest still rests in literature. “The demand of a writer is importantly the narrative ability. That is equally important in both fiction and screenwriting. I was reading ever since I could remember, and I had a real soft spot for creating stories. Of the three films I have made, two are based on novels:Viragaya and Karumakkarayo. Only Mahagedara I did the original script.” For that matter Tissa Abeysekara, the simple intellectual who will turn a septuagenarian next year, stays on being fond of literature. Tissa Abeysekara and Lester James Peries share one thing: both started off as journalists but ended up earning reputation as filmmakers towards the latter part of their lives. To see Dr. Tissa Abeysekara handing over the first copy of Bringing Tony Home and Stories to Dr. Lester James Peries at his residence last week, is then to state the obvious. “He was one who constantly encouraged me to keep on writing. In fact he has been privy to all these story plots. He is the one who strongly predicted that my books will reach international market one day. Hence I dedicate my first internationally published book to him.” Dr. Abeysekara said. “I have been a great admirer of his stories. I have read quite a lot of fiction, but I find something special in Tissa’s stories. For that reason I believed that he will reach the international market one day. And today I am simply happy that he has achieved what I believed one day. 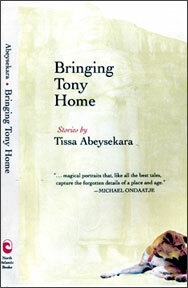 The book, I feel, is all about bringing Tissa home. 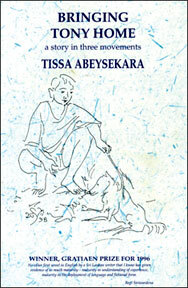 And the dog in the cover is lovely,” Dr. Peries commented with his smile quite impeccable and inimitable. The novella which won the Gratiaen Prize recounts the near-tragic tale of a young boy who returns to his old home to find Tony, the beloved dog his family abandoned when economic circumstances forced them to leave. A self publication. Rs. 300. Two childhood lovers come together as adults briefly revisiting the bittersweet events of their forbidden love fifteen years before. The boy, as a young man, tries to make sense of his complex relationship with his father during the years his family’s fortunes were disappearing. Hark, The Moaning Pond: A Grandmother’s Tale. A much older man revisits the loss of his grandmother and experiences a profound revelation of her place in the history and mythology of her people. May 7 1939 Born in Maharagama, a little railroad town twelve miles southeast of Colombo to middle-class parents who had moved from the city to the country in the middle thirties. Not sent to school till 11 due to poor health and tutored at home. 1952 Reveals a flair for writing early and has his first short story published in Dinamina, a national weekly. Continues to write in both Sinhala (Mother tongue) and English to newspapers and magazines right through the middle-teens. 1963 Gains recognition as an outstanding Film and Theatre critic in print and radio. 1964 Joins Lester James Peries as dialogue writer and first assistant director on Gamperaliya, which won the Golden Peacock Award for Best Feature Film at the Third International Film Festival, New Delhi. 1965-72 Works primarily as a screenwriter authoring eight scripts for major films and wins Best Scriptwriter Award four times annually at the national film awards. One film scripted during this period, Nidhanaya (Treasure), was selected the Best Film in Fifty Years of Sri Lankan Films in 1997 by a Critics poll. 1972 Joins the Government Film Unit (GFU) as a Film Director and works under the tutelage of the legendary German filmmaker Paul Zils, Consultant to the Unit at the time. In addition Abeysekara writes and directs over 40 documentaries on a variety of subjects for over 40 documentaries on a variety of subjects for the GFU. 1976 Granted special permission by the Government to direct a Documentary for the United States Information Agency on the Life of Colonel Henry Steele Olcott, famous American theosophist, to mark the Bicentennial of American Independence. 1977 Makes a sensational debut as actor playing the role of a militant Buddhist Priest in Lester James Peries’ historical epic, Puran Appu. Wins Presidential Award for Best Supporting Actor. 1981 Mahagedara wins all the major awards including the ones for Best Film and Best Script at the Presidential Awards. Abeysekara gets his first award for Best Director and is awarded the Best Supporting Actor’s award at the Sarasaviya National Film Awards. 1982 Visited Satyajit Ray in Calcutta and toured Europe. 1985 -86 Writes and Directs third feature film, based on a novel by Martin Wickremasingha and regarded as the greatest work in contemporary Sri Lankan fiction. Titled after the book as Viragaya (The Way of the Lotus), the film becomes a major critical and box-office success and was screened by special invitation at Moscow, Hawaii and New Delhi Festivals. Viragaya sweeps all the National Film Awards in 1986. 1990 On invitation by the Goethe Institute, participated in a retrospective of Documentary Films from the Federal republic Germany, titled, Starting Towards Freedom held at the Max Muhler Bhavan, New Delhi, in March. 1993 February - September, writes, produces, and directs, Part One of a 12 hour major Television Series - Pitagamkarayo (The Outsiders), in technical collaboration with the Sri Lanka Television Training Institute. 1995 February - August. Writes, produces, and directs, a Television adaptation of R.L.Spittel’s anthropological novel, The Savage Sanctuary, based on the indigenous peoples of Sri Lanka. 1996 Wins the Gratiaen Award for the Most Outstanding Piece of Creative Fiction by a Sri Lankan resident for his Novella, Bringing Tony Home. 1998 Pitagamkarayo wins all the major awards at the National Television Awards. June 2007 Conferred D. Litt (Honoris Causa) by the University of Colombo.